Farmyard Scene With Bridled Horse & Dog Attributed To John Hardman (British 1777-1846) Prov: Christies, London April 1991, Lot 101, 32 ½” x 25” With Frame. Early Portrait Of Little Girl With Blue Eyes Seated And Wearing A White Dress Trimmed In Lace And Coral Pin. Oil On Canvas, Laid down On Board. 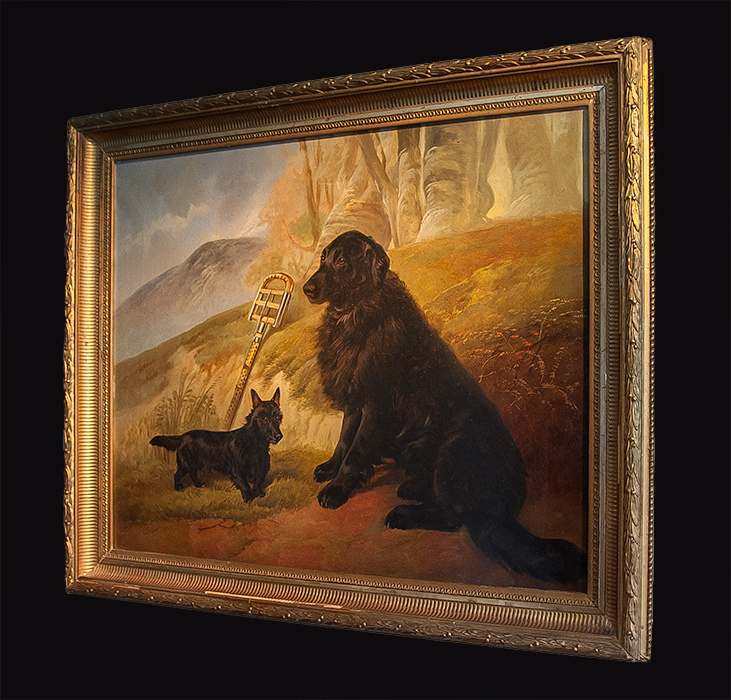 19th Century Oil Portrait of Dogs By Walter Harrowing. Portrait Of A Long Haired Labrador And Scottie. Hunting Stick In Foreground & Mountains In Distance. “Waking Up Papa” Small Oil On Board, With Original Pierced And Carved Frame. Philadelphia, School, Mid. To 3rd Quarter Of The 19th Century. This Impressive Oil Portrait of The Depicted With Various Flags, The American Flag and Figures On Board.